The “11th emotion” got many of us into astronomy. Can children today still experience it? Canst thou bring forth Mazzaroth in his season, or … guide Arcturus and his sons? When Barnard was a boy, it was still possible to see the Milky Way from downtown Nashville, and the sight of it filled him with awe. Today, in the U.S., less than 10 percent of children live in areas where views of the night sky are similar to those Barnard enjoyed. Would Barnard have felt the same sense of awe under the night sky that motivated him to underline that passage of Job, and that inspired him to a passionate life of studying and observing the sky, if he had lived under light-polluted skies? 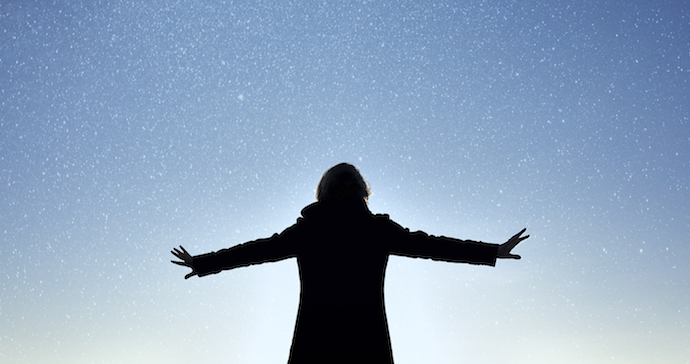 Awe, the emotion that is at the heart of what motivates us to do astronomy, is only recently getting its due from psychologists. Less familiar than the “big ten” (love, fear, sadness, etc. ), it has been called the 11th emotion. Humans may be the only species that can feel it, and some people may never experience it. Others, however, are intimately familiar with it and know well the accompanying tingling of the spine. Neuropsychologist Paul Pearsall defined awe as an “overwhelming and bewildering sense of connection with a startling universe that is usually far beyond the narrow band of our consciousness.” No doubt many Sky & Telescope readers can date the beginnings of their interest to a specific occasion of awe, perhaps the sight of a total eclipse or a majestic comet. Do young people today still experience awe? Increasingly, the visible universe is in full retreat. Of course, there will always be virtual substitutes: Cassini views of Saturn’s rings, Hubble Space Telescope images of distant galaxies, and so on. Stunning as they are, do they arouse the same profound, potentially life-changing emotion that direct sense of connection to the universe supplies? How long does it take for them to go from “awe-some!” to “bor-ing”? Perhaps Barnard, if he had lived today, instead of musing in solitude at the nearby planets in his small telescope, would have invested his time in Facebook. Maybe then he would have had more self-esteem, since recent studies have shown that use of social media increases narcissism (self-love). Awe, on the other hand, leads to a sense of a small self, says psychologist Paul Piff (University of California, Irvine), and it encourages those who feel it to exhibit more prosocial tendencies. They are more generous, empathic, and caring about others than their less awe-inspired peers. This is an argument, in my view, for making astronomy — and exposure to other aspects of “wilderness” — central to schemes of child development and to educational core curricula. If we encourage awe, astronomy’s core emotion, we will not only invite children to a lifelong passion to investigate the universe but encourage them to embrace kinder, more caring communities on Earth. Contributing Editor William Sheehan, whose biography of E. E. Barnard was published in 1995, recently retired after three decades as a psychiatrist. This article was first published in Sky & Telescope. A big thanks to Sky & Telescope for letting IDA republish the article. Previous post: What Do Dark Skies Mean to You?